In this game you play a wholesome villager tossing petpets into the cave of the snowbeast. You move using the mouse, build strength by holding down the left mouse button and throw by releasing the left mouse button. 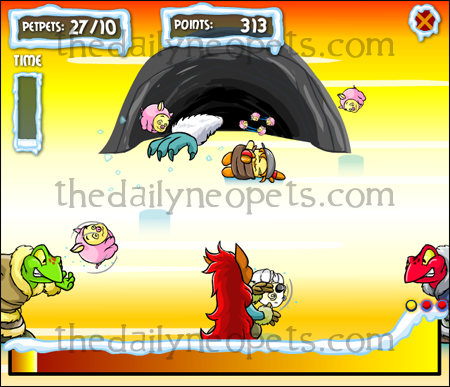 Your aim is to get every petpet into the Snowbeast's cave without getting intercepted by any of the Petpet Protection League. Don't worry, a quick swipe with a Polarchuck and he won't bother you. You play the Kyrii at the bottom of the screen. If you get a petpet in the cave, it's worth some wonderful points. Points are worked out for the strength of your shot. You get 2 points per petpet if you have a shot that's above half way on the power meter and 3 points per petpet if you have a shot that's over the three-quarters mark on the power meter. When you hold the left mouse button down, the power meter increases. The meter takes about 0.5 seconds to reach maximum power, which will knock down any of the PPL and (If the Snowbeast catches it) will give you a "Berzerk Point". These are outlined in more detail later on in the guide. But hold the left mouse button for too long and the power meter returns to zero and works its way back up. This can be both a blessing and a curse. You can hold down the left mouse button and easily release it when a petpet comes close, but it can also mean that a shot can be a really weak one because you released the power meter a split second too late. Practice the game and you'll naturally learn to stop doing this accidently. There are four levels. Level One requires 5 petpets in the cave and has no PPL helpers in your way. Level Two requires 10 petpets and has only one Chia from the PPL stopping you. Level Three requires 20 petpets and has both a Chia and a Kacheek stopping you. The final level requires 30 petpets and has a Chia, Kacheek and a Mynci stopping you. If you see the number of petpets in the cave is "more than you're supposed to have", don't worry. That's just how many petpets you need to complete the level. You will get points for petpets entering the cave above the amount that's needed, so don't stop! Obviously, the levels get harder with more of the PPL stopping you from sacrificing all your petpets. But at level one and two, take care with your shots. You don't need as many petpets in the caves at this time, so if you take the time to get a maximum power shot, you can earn some berserk points for use in the later rounds when you'll need them most. In levels three and four, your shots are more than likely going to be stopped by the PPL helpers, so simply go rapid fire with your petpets! Fire as many as you can at them to knock them down and eventually petpets will start making their way into the cave. Watch the clock! There are 10 snow blocks, which last for 3 seconds each in the first round and 6 seconds each every round after that. The level will end as soon as the last part of the last snow block has gone, no matter what you're doing. You could be sailing in that maximum power shot and it will get interrupted by the timer. Sorry! When you get three berzerk points (Getting the petpet into the cave at max power three times), you will go 'Berzerk'. This means that all of your shots will become maximum power shots to knock down all the PPL helpers and hopefully rack up some more points. These maximum power shots do not give you more berzerk points, however. This is what you'll see in Berzerk Mode. Despite there being no walls, you can still miss the Snowbeast's cave. Roughly twice as many petpets are fed to you by the two Techos, so don't be scared just to randomly click around where the petpets are as there will be plenty more. Once entered, Berzerk lasts 15 seconds and does not count towards the level time overall, luckily. You really don't want this ending prematurely, now, do you? My advice is that when in this mode, take advantage of the increase in petpet numbers. Stay in the centre and wait for the petpets to come to you! Standing in the centre will give you more of a chance to get them in rather than if you were standing on the edge, plus it gives you more time to prepare your shot and time it correctly. Whether you're against the sport or not, Snowbeast Snackrifice is a great, fun, simple game to play. Similar to other petpet-related games like Turmac Roll, Deck Ball or Snowball Fight, you can play a quick game to fill in a gap of spare time or play it for longer and dominate! The Snowager is awake. He'll be sleeping in 3 hours, 45 minutes.